Kieron Gillen's groundbreaking alternate war history begins a new terrifying chapter in super human World War II warfare. The Nazi's have enacted Hitler's master plan, the Great Burn is now turning all of Europe into a fire-blasted wasteland. City after city, country after country, the very earth itself is being purged by the unparalleled power of the German onslaught. With no answer on the horizon to stopping the Axis from purifying the entire continent, the Allies turn to Stephanie and the monster that is the HMH Churchill for a glimmer of hope. The horrors of super human warfare continue to rage throughout Europe and the destruction mounts to global levels. Uber is an unforgettable vision of the misery of war turned apocalypse. 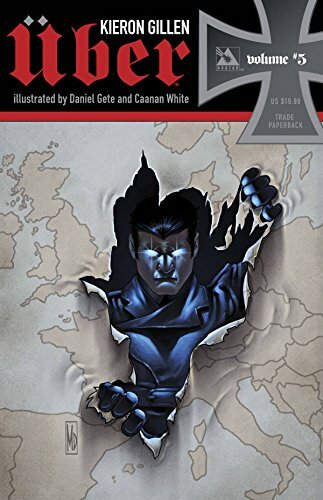 This volume collects issues #23 - 27 of the ongoing Uber comic book series and the Uber 2014 Free Comic Book Day Special. Kieron Gillen is a British creator best known for Phonogram, Marvel's Young Avengers, Journey Into Mystery, Invincible Iron Man, Uber.